This luxurious 2 bedroom Fairway Oaks Villa Rental on beautiful Kiawah Island, South Carolina has been renovated and refurnished. There is a fully equipped kitchen with new cabinets and granite countertops, dining room, 2 bedrooms, 2 full bathrooms, and a large living room looking out to a lush forest and exotic lagoon - so characteristic of the island. The master bedroom has a KING-sized bed, private updated bathroom, walk-in closet with safe for your valuables, 32' LCD TV w/cable and DVD/VCR, and the second bedroom has two twin beds, LCD TV w/cable and full bathroom. All beds have new mattresses. The living room has sleeper sofa, Computer Desk, FREE SECURE Wifi INTERNET ACCESS, Flat screen' LCD TV w/cable, Smart DVD player. The back deck, accessible off the living room, provides a comfortable area to enjoy beverages or a meal, while overlooking the lagoon. This beautiful villa with FIRST FLOOR convenience sleeps 6 very comfortably. Sorry no pets or smoking allowed. Our Villa's ideal West Beach location is adjacent to the 17th fairway of Gary Player's challenging Cougar Point Golf Course and less than a five-minute walk to the NEW WEST BEACH POOL and 10-mile beach along the Atlantic Ocean. You can walk to many amenities including restaurants, The Village Shops, and the Fitness Center. Also you are close-by to the new award-winning Freshfields Shopping area at the entrance to Kiawah Island. ALL OF OUR GUESTS ARE ENTITLED TO ALL OF THE RESORT AMENITIES AT NO EXTRA CHARGE. Free access to all FOUR of the Resort's pools including the New West Beach Pool, Exclusive use of the ocean front Kiawah Resort's Night Heron Pool which is now heated thru Thanksgiving, Complementary On-island transportation, Access to the Fitness Center, Towel service, Discounted rates and preferred access for golf (including 60-day advance tee times) and, Discounts rates for kids camp and other recreational activities, Wonderful dining experiences at the Resort fine restaurants, Ten mile ocean beach for swimming, sun bathing, walking and biking, Five world class golf courses, a world class tennis club, 30 miles of paved paths for biking, in-line skating, jogging and hiking, Nature watching, Sailing, Kamp Kiawah for kids, Canoeing and kayaking on the creeks and Kiawah River. We live in downtown Charleston only about a 35 minute drive to our Kiawah villa. We have the best of both worlds - Kiawah with its championship golf and tennis, beautiful beaches and pools and frequent social events - and Charleston with its art and music, sporting events, fine restaurants and shopping. The Resort does a great job in maintaining and managing our villa but our frequent hands-on check of the villa's amenities assures the quality and condition of our high standards - as if it were our permanent home. The frequent positive reviews of our villa by our guests have verified that we are doing it right! 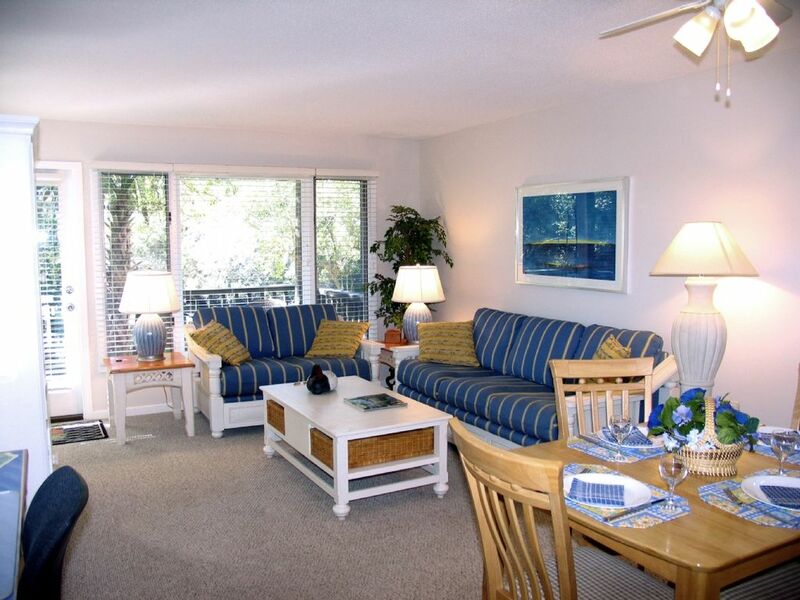 We are in the Kiawah community that is closest to Freshfields shopping and downtown Charleston. Exclusive use of all of the Resort's 4 pools including Night Heron Pool Complex which is seasonally heated or cooled and the new West Beach Pool with Waterslides and other features; Free secure WiFi Internet Access; Newly renovated kitchen with new cabinets and granite countertops; Full size Clothes Washer and Dryer. We loved Kiawah the beach was glorious and we thoroughly enjoyed our bike rides on the beach. The property was conveniently located easy to get to from main entrance road and access to amenities was good. The new construction is noisy, and makes beach access more circuitous.the condo was good value for money and comfortable. Great location and view but needs a good cleaning. The location of the property is perfect. Very close to the beach and beautiful view! My only complaint was the cleanliness of the villa. The bathrooms looked like my kids had cleaned them. There was hair in the corners of both showers. Many of the dishes were in the cabinet and dirty. From the previous reviews I know this is not fault of the owner. The owner may want to address the complaints with management. Lots of construction going on during our stay and the pools that we were hoping to enjoy were closed. Again no fault of the owner but you may want to call first to see if they are open. The unit is in a decent location. It's quiet and overlooks the lagoon. It's an easy walk to West Beach Pool and not too far to the beach, although with three kids and lots of stuff we drove and there was ample parking. The unit could be spruced up some but the price is very low compared to other properties with resort privileges. If you want access to the pools at a much lower price than renting through Kiawah Island Golf Resort, then rent with this owner. Beautiful location at an amazing price. The Villa and location are perfect. We were very satisfied with our stay. We will be back. Nice two bedroom condo. Deck overlooks small alligator pond. Short walk to beach. Pool was closed, but we went to the Heron Pond Pool instead. Cougar Golf Course right across the street. Great place to stay while exploring Kiawah Island. It was a great place, well kept in West Beach. Just be sure to call the resort to ensure West Beach amenities are open before you go. They weren't when we were there, but Heron Park is close enough. Kiawah is unique among privately gated beachfront resort communities. Her 10-mile beach and 10,000 acres of semi-tropical beauty provide a peaceful and secure residential and resort lifestyle. With this extraordinary composition of natural and modern amenities, Kiawah's award-winning master plan sets her apart from all other coastal communities on the Eastern Seaboard. The private, natural feel of the island comes not by accident, but by design. Kiawah's founders employed a planning concept that maintains the natural maritime forest, sand dunes, and beachfront beauty of the island - home to white-tail deer, raccoons, egrets, herons, turtles and alligators. With the charm of historic Charleston only a 35 minute drive away, Kiawah Island has become a premier east coast destination. Golf: Kiawah offers five top rates golf courses with discounted greens fees and advance tee times for our guests. There are also many fine public golf courses within easy driving distance for those seeking off-island venues. Charleston not only offers an opportunity to step back in time and learn about our country's heritage, but also the unique chance to partake in modern arts, wander along cobblestone streets, explore antique shops, tour the city on a horse-drawn carriage or enjoy the fantastic cuisine of some of Charleston's renowned restaurants. When you visit this charming city you will see for yourself why the readers of Conde Nast Traveler magazine rated it among the top domestic destinations.